Are you dealing with the inconvenience and shame of having missing teeth? What was once easy to do is now difficult (eating, chewing, speaking), and you feel as if there’s nothing you can do. Well, there’s good news! Missing teeth can now be easily replaced using a variety of restorative dentistry options, including dentures. Learn more about the various types of dentures and which solution is right for you. When speaking with your dentist about treatment options, he may suggest everything from traditional dentures, partial dentures, or even implant-retained dentures. 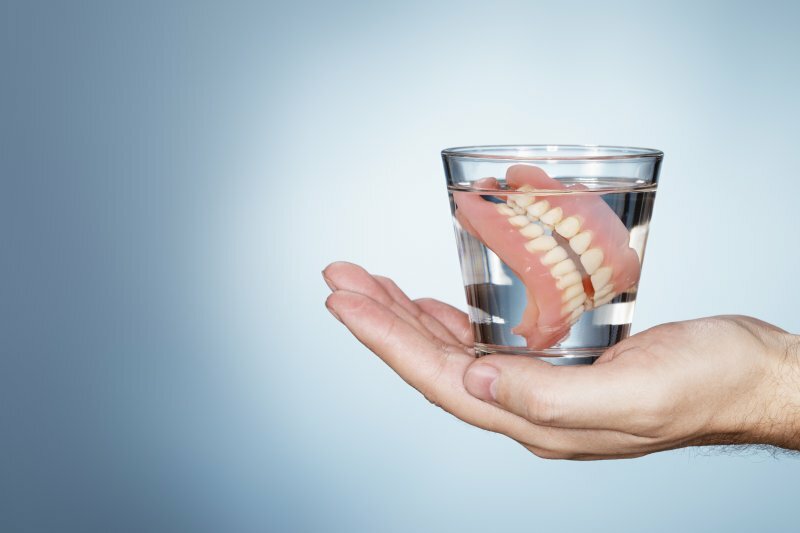 Depending on the number of teeth you need to have replaced, as well as the condition of your jawbone and nearby teeth, can determine the type of dentures that are right for you. There’s not a one size fits all solution, so you can expect to receive a customized treatment plan for your dental needs. Your natural suction will hold them in place; however, adhesive can provide additional security. If you are concerned about the cost of your new teeth, traditional dentures are often a more affordable option. They are removable, which is convenient for soaking and cleaning purposes. Mounted on a gum-colored base, this prosthetic is secured using clips or brackets that fasten to nearby teeth. They are not permanently in place, which means you can easily remove your dentures and clean them overnight while you sleep. Their custom fit will blend in nicely with your other teeth, so will be unable to tell the difference between your natural and artificial teeth. If your missing teeth are keeping you from the things you once loved, don’t waste any more time! Talk to your dentist today about dentures and the various treatment options. You don’t have to go through life ashamed of the teeth you’re missing. Take back your smile with dentures! Dr. Dennis E. Stansbury earned his undergraduate degree at Texas A&M before pursuing his Doctor of Dental Surgery degree at Baylor College of Dentistry in Dallas. Interested in the ever-changing field of dentistry, he regularly participates in continuing education courses to strengthen his skills and knowledge. He and his team at Stansbury Dental care for your oral well-being, so if you’re in need of dentures or another form of restorative treatment, Dr. Stansbury will ensure you have a proper fit and beautiful smile when you leave. To learn more, contact us at (903) 561-1122.